A Pic From Signing at Beaverdale Books! Which Scares You The Most? In my books, I explore the fears that many people have. And yes, sometimes they are things that go bump in the night, but often, the fear in my stories comes from very real people placing others in horrific situations. Here are a few samples. Read through them, then vote at the end on my reader poll. Cindy finished off her drink, exiting in the direction of the master bath. After pulling open the ivory curtain, she turned on the water. Time for a little more wine. Cindy rushed down the stairs, grabbing the bottle from the table. On her way back up, she realized she couldn’t hear the water running. She stopped at the top of the stairs. Was Mark here and playing games with her? By entering the bathroom, Cindy cut out any opportunity for escape. The dark, masked figure slipped out from her bedroom and was just a feet feet from the bathroom doorway, hidden in the shadows. Brian Jeffers rushed for the sedan with his weapon at the ready. Why would this man be here if he wasn’t trying to kill the rest of my family? This has to be the guy. He dove for the ground as a ring of gunfire cut through the bitter cold. The barrage of metal seemed to last forever, but in reality, it was just seconds. Brian Jeffers didn’t feel the two rounds that penetrated his uniform or the path each made when they struck the tactical vest. He drifted into the darkness, where a peaceful sleep awaited him. Lucifer saw Tamia Stevens exit her vehicle and walk within five feet of where the alcove had him hidden. He could smell the strong, luxurious odor of her perfume as she walked by him and up to lock her door. He watched as she placed her house key ito the door lock and began opening the door. Before she realized something was wrong, Lucifer was on her from behind, pushing her farther into the residence. He kicked the door shut with his back foot, slamming it, ending the model’s hopes of ever leaving again. Winner of Signed Hardcover of 3:16 Announced! 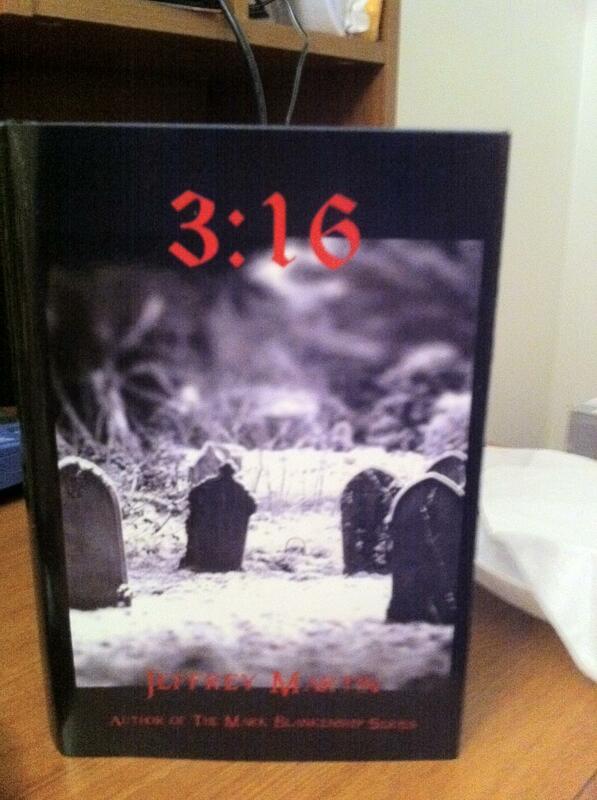 Win a Signed, Special Edition Hardcover of 3:16! Want to win a signed, special edition hardcover of my latest release? The first 50 people to email me at jeffreymartinsnovels@gmail.com get their name thrown into a hat for a drawing to win my book! Don’t forget…if you’re in the Des Moines area, meet me at Beaverdale Books on January 29. Want more info? Click here. 3:16 Now Available on Amazon! We’ve been patiently awaiting the release of 3:16 on Amazon, and at last it is here! You can now purchase your copy online today. Want a sneak peak? Keep reading! Wonderful…nobody had found my hiding place. Brandon dropped down to one knee and used both his hands to dig away the earth hiding his prized possessions. Ah, there you are. Reaching into the exposed hole, he pulled out a medium-sized brown leather pouch. His pulse quickened as he fumbled with the clasp. Easy…you’ve got this. Taking a few deep breaths, he slowly opened the pouch, reached inside, and pulled out several cloth-wrapped items. He unrolled the first, and the most beautiful double-edged blade he had ever set eyes on glistened in his grasp. Brandon repeatedly ran his fingers along the knife’s length, worshipping the texture and the craftsmanship of the weapon. All the other knives in the pouch were equally exquisite, and all were very capable of carrying out what he needed done, but Brandon had a special place in his heart for this one. Sort of like a good friend coming back into my life, he thought. BUY IT NOW BY CLICKING HERE! In the Des Moines area? 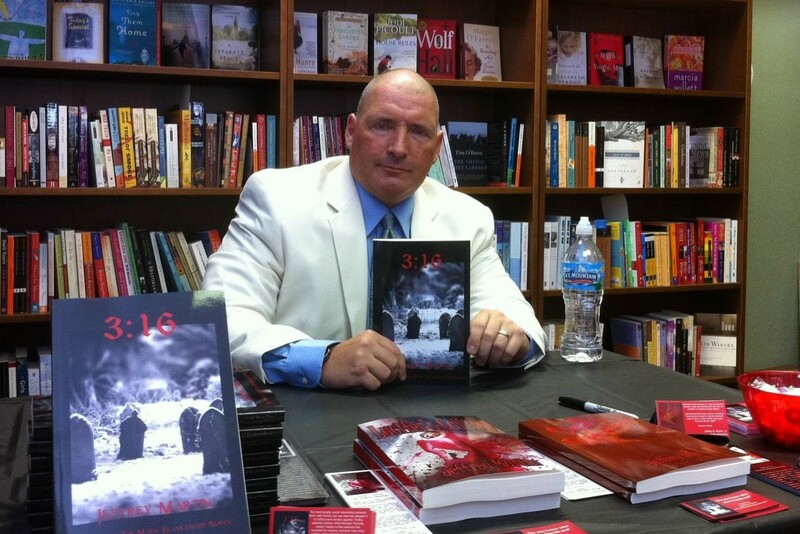 Meet me for an author signing of my latest novel, 3:16, at Beaverdale Books! I will be there beginning at 1:00 p.m…hope to see you there. Want more info or need directions? Visit the announcement in the Des Moines Register.